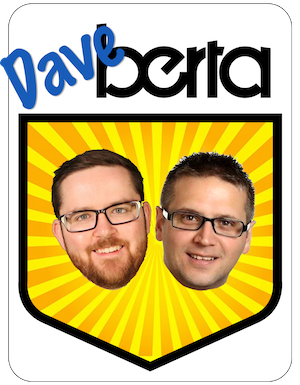 It has been a busy week for me, so without the time to write a full column-type post, here is a quick summary of what I have been watching in Alberta politics over the past few days. Calgary-Centre Member of Parliament Kent Hehr was appointed Minister of Sports and Persons with Disabilities this week as part of a fairly significant shuffle in Prime Minister Justin Trudeau’s cabinet. Hehr had previously served as Minister of Veterans Affairs, a post he had held since his election in 2015. Though the move is viewed as a demotion at worst or a lateral move at best, there is no indication that the shuffle was a reflection on Hehr’s performance as minister, which appeared to fulfill competently. As a former amateur athlete and leader in the Canadian Paraplegic Association, Hehr appears to be a good fit for this role. While the Minister of Sports is traditionally seen as a junior level position in cabinet, the prospect of Calgary bidding for the 2026 Winter Olympics and Canada joining with the United States and Mexico in a bid to co-host the 2026 World Cup could increase its political importance. Meanwhile, Calgary-Skyview Liberal MP Darshan Kang announced he would take a medical leave of absence due to stress caused by allegations of sexual harassment that have dogged the federal politician over the past few weeks. Following this week’s federal cabinet shuffle, Conservative Party leader Andrew Scheer announced a new roster of Official Opposition critics. Alberta Conservative MPs in the shadow cabinet include: International Development critic Ziad Aboultaif, Agriculture and Agri-Food critic John Barlow, Status of Women critic Rachael Harder, Science critic Matt Jeneroux, National Revenue critic Pat Kelly, Immigration, Refugees and Citizenship critic Michelle Rempel, and Natural Resources critic Shannon Stubbs. Economic Development and Trade Minister Deron Bilous continues his town hall tour of Alberta’s coal communities this week. In the Town of Hanna, Bilous and mayor Chris Warwick announced $450,000 in funding create Community Action Teams led by the Cactus Corridor Economic Development Corporation to focus on initiatives identified in a report by the Hanna Climate Change Strategy Task Force. While Bilous left Hanna with more questions than answers, he deserves some credit for traveling to these communities holding these town halls – something the NDP government should have done two years ago. 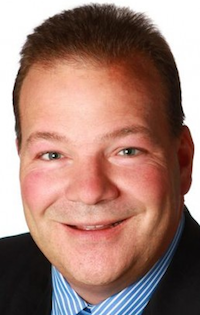 Jeff Callaway was looking to generate headlines for his United Conservative Party leadership campaign, and he succeeded with his proposal for the Alberta government to nationalize and build a pipeline to access Manitoba’s Port of Churchill. Federal NDP leadership candidate Niki Ashton, who is the MP for Churchill—Keewatinook Aski, called on the federal government to nationalize the port of Churchill in Dec. 2016. Speaking of the federal NDP, the party released the breakdown of membership numbers by province ahead of its September leadership vote. Despite having one of only two NDP governments in the country, the federal NDP only recorded having 10,188 members in Alberta, compared to 52,200 in Ontario and 31,974 in British Columbia. The low participation rate may have a lot to do with the deep political divide between the Alberta NDP and its federal and provincial counterparts over the expansion and construction of oil pipelines, which is a priority for Rachel Notley’s government. To my knowledge, no Alberta NDP MLAs have released public endorsements for any of the federal NDP leadership candidates. Until recently he was rumoured to be eyeing the federal Conservative nomination in the upcoming Sturgeon River-Parkland by-election, but it was announced today that Garry Keller, a former chief of staff to Rona Ambrose, would join the United Conservative caucus as a special advisor. This entry was posted in Alberta Politics and tagged Alberta NDP, Andrew Scheer, Chris Warwick, Coal Communities, Darshan Kang, Deron Bilous, Garry Keller, Jeff Callaway, John Barlow, Kent Hehr, Matt Jeneroux, Michelle Rempel, New Democratic Party of Canada leadership race 2017, Niki Ashton, Pat Kelly, Port of Churchill, Rachael Harder, Rachel Notley, Rona Ambrose, Save Calgary, Shannon Stubbs, Sturgeon River-Parkland by-election, United Conservative Party, Ziad Aboultaif on August 31, 2017 by Dave Cournoyer. Airdrie: Mayor of Airdrie Peter Brown announced this week that he will seek the Progressive Conservative nomination. Mr. Brown was first elected Mayor in 2010. 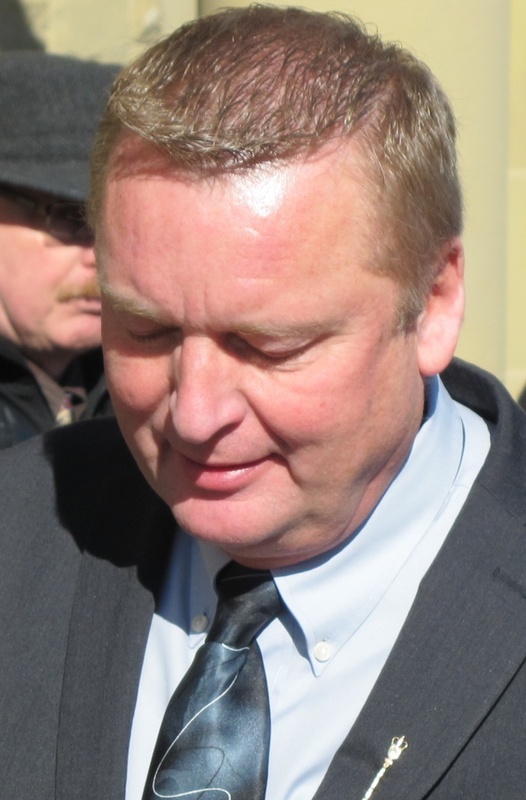 The constituency is currently represented by PC-turned-Wildrose-turned-PC MLA Rob Anderson, who announced his retirement from politics this month. Banff-Cochrane: Scott Wagner has been nominated as the Wildrose candidate. In 2014, Mr. Wagner made an unsuccessful bid for the federal Conservative Party nomination to run in the Macleod by-election. During that campaign he issued criticized now-MP John Barlow and calling for a judicial inquiry into allegations that RCMP seized privately owned firearms during the High River floods of 2013. 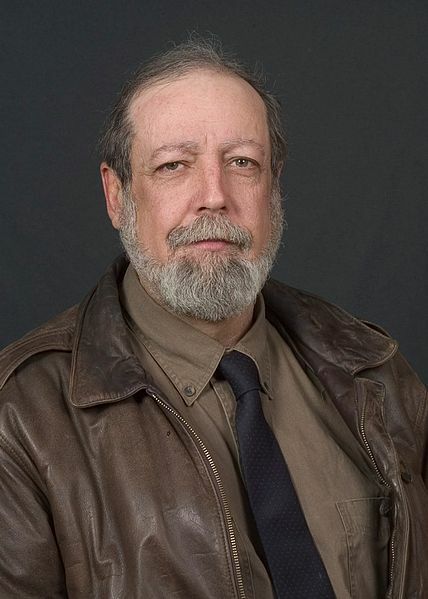 Calgary-Buffalo: Well-known arts community member Terry Rock will seek the PC nomination. The constituency is currently represented by Liberal MLA Kent Hehr, who is the nominated federal Liberal candidate in Calgary-Centre and is not expected to seek re-election as MLA. Calgary-Currie: First-term PC MLA Christine Cusanelli announced on Facebook that she will seek re-election. Ms. Cusanelli served as Minister of Tourism, Parks and Recreation for less than a year before an Olympic travel spending scandal led to her demotion to the backbencher. She is expected to face a challenge for the PC nomination. Calgary-East: Ali Waissi is the Wildrose candidate in this constituency. In 2012, he was campaign manager for controversial Calgary-Greenway Wildrose candidate Ron Leech. The NDP are expected to choose Robyn Luff as their candidate at a Feb. 8, 2015 nomination meeting. Ms. Luff earned 8.73% of the vote as the NDP candidate in 2012 (her party’s second strongest showing in Calgary in that election). Calgary-Glenmore: Chris Kemp-Jackson is the Wildrose candidate in this constituency. Mr. Kemp-Jackson is a business and immigration consultant. 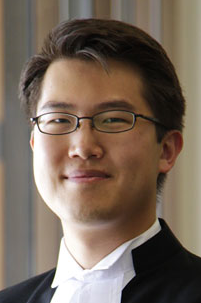 Calgary-Hawkwood: The Wildrose have chosen lawyer and constituency association president Jae Shim as their candidate. Calgary-Klein: Feb 8 Craig Coolahan is expected to be chosen as the NDP candidate at a Feb. 8, 2015 nomination meeting. Mr. Coolahan is a Business Representative with the United Utility Workers’ Association and was the 2012 NDP candidate in Calgary-Elbow. Calgary-Lougheed: Two-time Mount Everest climber Dave Rodney will seek the PC nomination. Mr. Rodney has also served as the PC MLA for this constituency since 2004. Calgary-Mackay-Nose Hill: Retired police officer Kathy Macdonald has been nominated as the Wildrose candidate in this constituency. In 2014, Ms. Macdonald challenged Premier Jim Prentice as the Wildrose candidate in the Calgary-Foothills by-election. 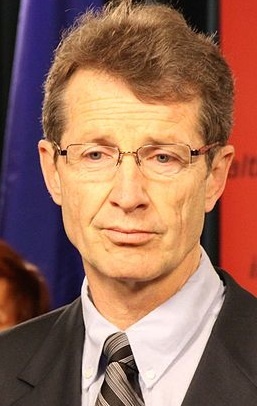 Calgary-Mountain View: Three-term Liberal MLA David Swann is expected to announce his plans to seek re-election. The Liberals have scheduled a nomination meeting on February 20, 2015. Jean-Sebastien Rioux announced he will seek the PC nomination. Mr. Rioux is the Director, Master of Public Policy program, and Associate Director, International Policy at the University of Calgary School of Public Policy. He also served as Chief of Staff to Mr. Prentice when he was a cabinet minister in Ottawa. Edmonton-Decore: Two-term PC MLA Janice Sarich announced she will seek her party’s nomination for re-election. 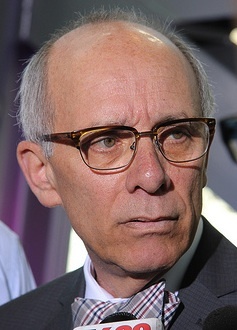 Edmonton-Whitemud: Health Minister Stephen Mandel is expected to seek the PC nomination for re-election. Mr. Mandel was first elected to the Assembly in a by-election in September 2014. Lethbridge-East: Lawyer Tammy Perlich is the first candidate to enter the PC nomination contest. Current PC MLA Bridget Pastoor announced her retirement earlier this month. 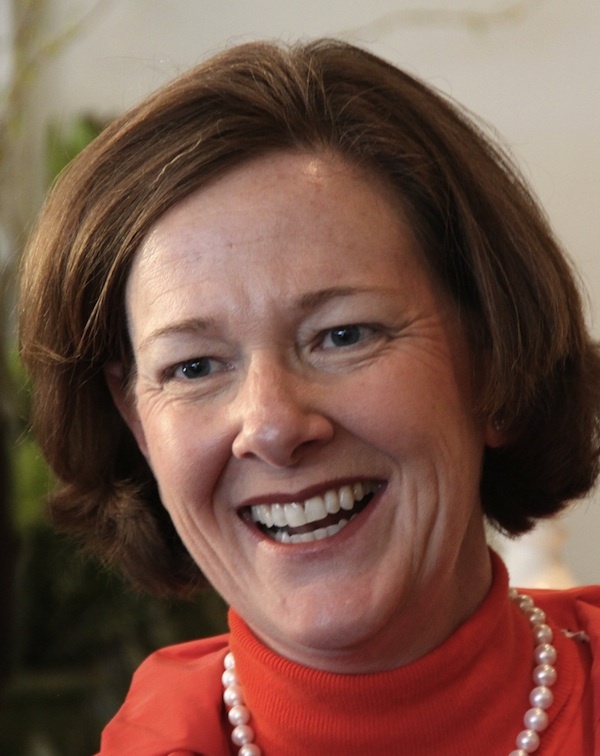 Helen McMenamin is rumoured to be eyeing the Liberal Party nomination. Grande Prairie-Wapiti: PC MLA Wayne Drysdale announced on Facebook that he plans to run for re-election. Mr. Drysdale was first elected in 2008. Innisfail-Sylvan Lake: Mayor of Red Deer County Jim Wood announced that he will challenge Wildrose-turned-PC MLA Kerry Towle for the PC nomination. 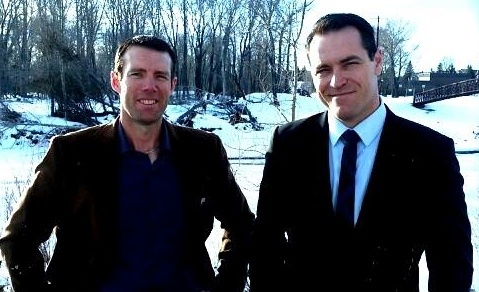 During the 2012 election, Mr. Wood endorsed PC MLA Luke Ouellette, who was unseated by Ms. Towle in the Wildrose sweep of central and southern Alberta. Following that election, he raised concerns about how the PC Government would treat rural Alberta constituencies represented by opposition MLAs. Peace River: Energy Minister Frank Oberle announced on Facebook that he plans to seek the PC nomination and re-election. Rimbey-Rocky Mountain House-Sundre: ATB employee Tammy Cote is seeking the PC nomination and may face a challenge from current Independent MLA Joe Anglin. Ms. Cote is the grand-niece of former PC MLA and lieutenant-governor Helen Hunley. Spruce Grove-St. Albert: Jaye Walter has been nominated as the Wildrose candidate in Spruce Grove-St. Albert. Previous to this nomination he had been seeking to become the candidate in the St. Albert constituency. This entry was posted in Alberta Politics and tagged 2015 Alberta Election, Airdrie, Ali Waissi, Banff-Cochrane, Bridget Pastoor, Calgary-Buffalo, Calgary-Currie, Calgary-East, Calgary-Glenmore, Calgary-Hawkwood, Calgary-Klein, Calgary-Mackay-Nose Hill, Calgary-Mountain View, Candidate nominations, Chris Kemp-Jackson, Christine Cusanelli, Craig Coolahan, David Swann, Edmonton-Decore, Edmonton-Whitemud, Frank Oberle, Grande Prairie-Wapiti, Helen Hunley, Helen McMenamin, Innisfail-Sylvan Lake, Jae Shim, Janice Sarich, Jaye Walter, Jean-Sebastien Rioux, Jim Wood, Joe Anglin, John Barlow, Kathy Macdonald, Kent Hehr, Kerry Towle, Lethbridge-East, Luke Ouellette, Peace River, Peter Brown, Rimbey-Rocky Mountain House-Sundre, Rob Anderson, Robyn Luff, Ron Leech, Scott Wagner, Spruce Grove-St. Albert, Stephen Mandel, Tammy Cote, Tammy Perlich, Terry Rock, Wayne Drysdale on January 24, 2015 by Dave Cournoyer. Conservative candidates were elected in two federal by-elections yesterday in Alberta. This is an event which would normally not be a source for much commentary, but there are some interesting points to be made from the outcome of these two by-elections. 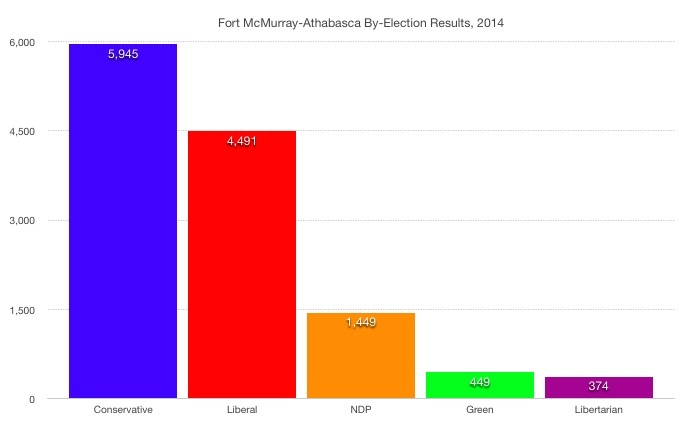 Unofficial results of the 2014 federal by-election in Fort McMurray-Athabasca. In Fort McMurray-Athabasca, Conservative David Yurdiga was elected with 5,945 votes (47% of the vote), significantly lower than the landslide 21,988 votes (71.8% of the vote) earned by former MP Brian Jean in the 2011 general election. The regional breakdown of the votes could provide some interesting insight into this by-election, as Mr. Yurdiga hails from the voter-rich southern limits of this large rural riding. 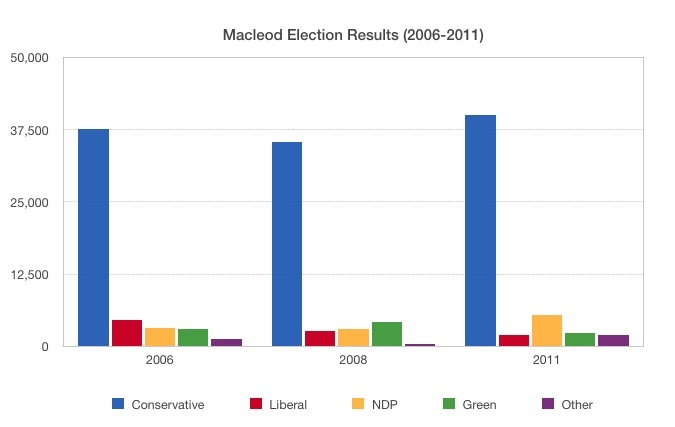 In Macleod, John Barlow was elected with 12,394 votes (68%), only slightly lower than the 77% earned by MP Ted Menzies in 2011. The Liberals dislodged the official opposition New Democratic Party as the main challenger to the Conservatives in both ridings. 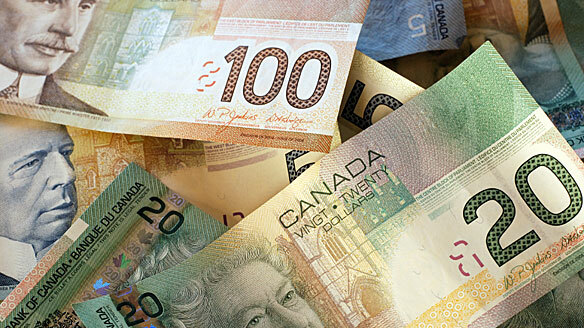 Strong local campaigns as well as a boost from Liberal leader Justin Trudeau, who visited the ridings numerous times during the by-elections, likely contributed to these results. Fort McMurray-Athabasca Liberal Kyle Harrietha placed a strong second with 35.3% of the vote (4,491 votes), up from his party’s 10% in the 2011 general election. While the Liberals were not able to pull off a win, they should not be disappointed with their level of support. Percentage wise, this is the strongest a non-conservative candidate has placed in this riding since 1980. 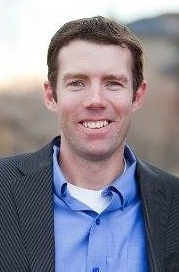 In Macleod, Liberal Dustin Fuller earned 17% of the vote (3,062 votes), up from his party’s distant 3.6% fourth place finish in the 2011 general election. Unofficial results from the 2014 federal by-election in Macleod. Voter turnout was abysmally low. Only 15.19% of registered voters cast a ballot in Fort McMurray-Athabasca and 19.59% voted in Macleod. Although by-elections traditionally attract low voter turnout, Prime Minister Stephen Harper’s choice to schedule the voting day between a weekend and Canada Day likely contributed to the low participation. On Canada Day, we should reflect on how voter participation strengthens our democracy and the consequences of ignoring our country’s political and electoral process. This entry was posted in Alberta Politics and tagged Brian Jean, Canada Day, David Yurdiga, Democracy, Dustin Fuller, Fort McMurray-Athabasca by-election, John Barlow, Justin Trudeau, Kyle Harrietha, Macleod By-Election, Stephen Harper, Ted Menzies, Voter Participation, Voter Turnout on July 1, 2014 by Dave Cournoyer. 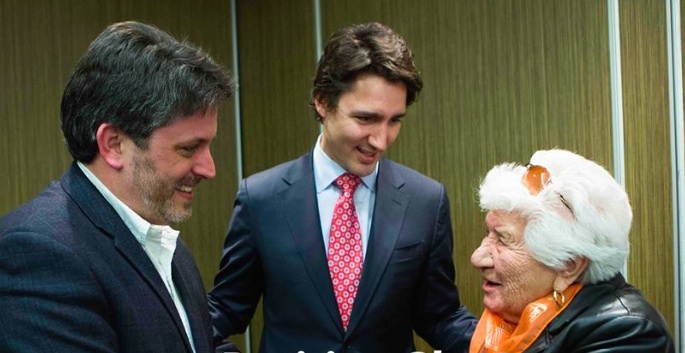 Fort McMurray-Athabasca Liberal candidate Kyle Harrietha with Justin Trudeau. On Monday, June 30, voters in four federal ridings across Canada, including Alberta’s Fort McMurray-Athabasca and Macleod, have an opportunity to choose their next Member of Parliament. Paying close attention to a by-election campaign may not be the most thrilling activity to occupy your time during the summer months, but it is an important one. Voters in southern Alberta’s Macleod riding are expected to march into the ballot box and elect Conservative John Barlow as their next MP, but the race in the vast northern riding of Fort McMurray-Athabasca could produce much more interesting results after the polls close at 7:30 p.m. tomorrow. While the opposition parties have written off the area in the past, it is hard to make that argument in 2014. Kyle Harrietha has run the strongest Liberal campaign the riding has seen in a generation, and has been boosted by leader Justin Trudeau, who has visited the riding three times since Conservative MP Brian Jean resigned in January 2014. New Democratic Party leader Thomas Mulcair had been scheduled to visit the riding and campaign alongside Lori McDaniel during the by-election but cancelled his planned trip to attend the funeral of the three murdered R.C.M.P. officers in Moncton, New Brunswick. Prime Minister Stephen Harper, still leader of the Conservative Party of Canada, was nowhere to be seen during this by-election. While national issues like the controversial Enbridge Northern Gateway Pipeline, the Temporary Foreign Workers Program and the ongoing environmental debates about climate change and the impact of Oil Sands development, are sure the play a role in how voters decide to cast their ballots, Tip O’Neill‘s well-known saying “all politics is local” will certainly be a factor in this by-election. Fort McMurray is a booming community where there are serious concerns about the lagging pace of infrastructure investment from the provincial and federal governments. The pace of economic growth sparked a huge influx of diverse migrants from across Canada and the globe. While the region is an economic engine for the country, residents I have spoken with feel their community has been forgotten, or just plain ignored, by the higher levels of government. 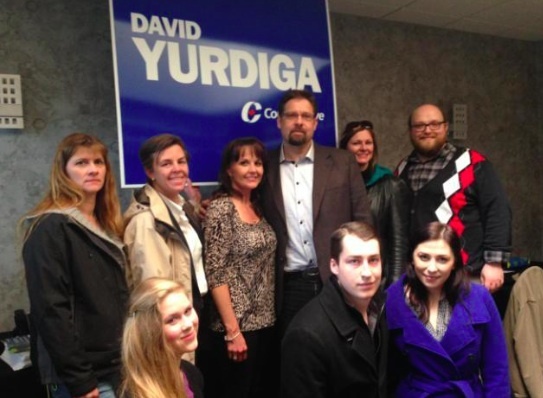 Federal cabinet minister Kellie Leitch campaigned with Conservative candidate David Yurdiga in Fort McMurray in May 2014. Conservative candidate David Yurdiga has played a peekaboo campaign, skipping all-candidates debates and not engaging with voters on social media (he has been accused of “blocking” local voters who have criticized him on Twitter). He hails from the voter-rich southern reaches of the riding in Athabasca County, which faces some similar and many different issues than the industrial oil capital to the north. In the south, Mr. Yurdiga has received the endorsements of Wildrose MLA Shayne Saskiw and embattled provincial Education Minister Jeff Johnson. As Canadians have witnessed many times in the past, by-elections pose a risk to incumbent governments, as they give voters an opportunity to send a strong message of approval or disapproval to Ottawa without changing who is in power. Former Conservative MP Mr. Jean was re-elected in 2011 with a 17,935 vote margin of victory over his closest challenger. If Mr. Yurdiga is elected with even a significantly smaller margin, voters will send a message that will quickly be forgotten in Ottawa. If voters in this riding elect Mr. Harrietha tomorrow, they will send shockwaves through the comfortable Conservative establishment in the nation’s capital. This entry was posted in Alberta Politics and tagged All politics is local, Athabasca County, Brian Jean, Climate Change, David Yurdiga, Enbridge Northern Gateway Pipeline, Fort McMurray-Athabasca by-election, Jeff Johnson, John Barlow, Justin Trudeau, Kellie Leitch, Kyle Harrietha, Linda Duncan, Lori McDaniel, Macleod By-Election, Oil Sands, Oilsands, Public Infrastructure, Shayne Saskiw, Stephen Harper, Temporary Foreign Workers Program, Thomas Mulcair, Tip O'Neill, Wood Buffalo on June 29, 2014 by Dave Cournoyer. Earlier this week, I wrote about the interesting by-election in Fort McMurray-Athabasca, today I look at the other federal by-election in Alberta that will take place on June 30, 2014. Situated on the eastern slopes of of the Rocky Mountains, the Conservative machine appears strong in southern Alberta’s Macleod riding. 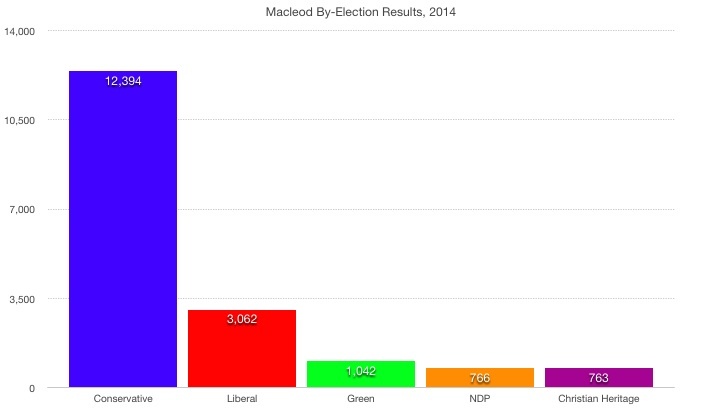 Although growth in the communities of Okotoks and High River, which was devastated by flooding in the summer of 2013, have brought many new voters in the riding, Macleod is a much more traditionally Conservative riding than its northern by-election counter-part. Respected local newspaper editor John Barlow won a hotly contested nomination race in which he faced loud criticism from the National Firearms Association for his support of RCMP gun-seizures during the High River floods. The gun lobby endorsed his nomination opponents but have remained silent since the nomination vote was held. 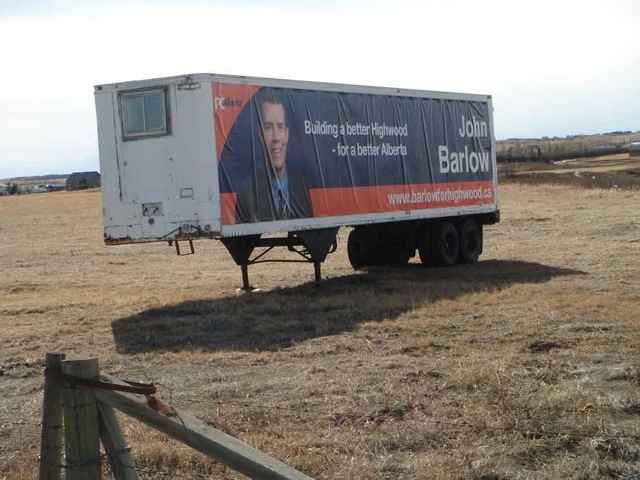 This is Mr. Barlow’s second attempt at political office, having recently run as the Highwood Progressive Conservative candidate against Wildrose leader Danielle Smith in the 2012 provincial election. Unlike the Calgary-Centre by-election of 2012, which saw a federal split among PC and Wildrose supporters, it appears that most Wildrosers are lining up behind Mr. Barlow’s campaign (or, at least, are not publicly opposing him). One media report from the riding suggest that Prime Minister Stephen Harper may become a defining issue of this by-election campaign. Mr. Harper and his family are said to have recently purchased property near Bragg Creek in the northern portion of Macleod. The prime minister’s wife, Laureen Harper, was seen voting at the Conservative nomination meeting on March 8, 2014. 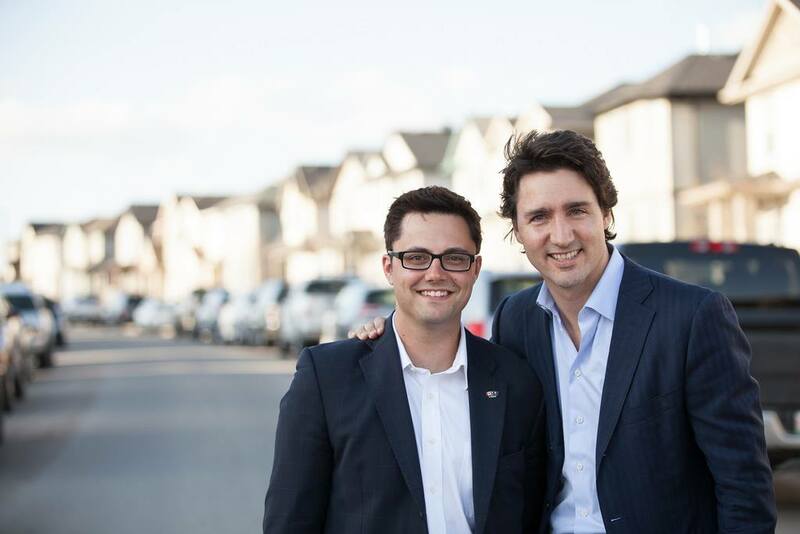 Liberal candidate Dustin Fuller and Justin Trudeau (from the Dustin Fuller for Macleod Facebook page). Mr. Barlow so far faces only two challengers. Liberal Dustin Fuller, an oil and gas worker has been campaigning for months. Mr. Fuller works in the energy sector and is a former president of the University of Lethbridge Students’ Union. Liberal leader Justin Trudeau has visited the riding numerous times, drawing curious crowds in Okotoks and High River. The last time a federal Liberal was elected in this region, was when his father, Pierre Trudeau, led his party to a majority victory in the 1968 election. The Green Party has chosen Larry Ashmore to carry their banner in the by-election. Mr. Ashmore is the former leader of the Evergreen Party (now renamed the Green Party of Alberta) and was a candidate in the 2008 and 2012 provincial elections in Foothills-Rockyview and Livingstone-Macleod . In the 2006 federal election, he placed fourth with 3,075 votes (6.18% of the vote) as the Green candidate in Macleod. Aileen Burke is expected to be nominated as the NDP candidate. Mr. Burke is listed as the treasurer of the Lethbridge-East provincial NDP constituency association and was a trustee candidate for the Lethbridge School District No. 51 in the October 2013 municipal elections. This entry was posted in Alberta Politics and tagged Aileen Burke, Bragg Creek, Calgary-Centre, Canada National Firearms Association, Danielle Smith, Dustin Fuller, Foothills-Rockyview, Fort McMurray-Athabasca by-election, Green Party of Canada, Gun Lobby, High River, Highwood, John Barlow, Justin Trudeau, Laureen Harper, Lethbridge School District No. 51, Lethbridge-East, Livingstone-Macleod, Macleod By-Election, Okotoks, Pierre Trudeau, Stephen Harper, Ted Menzies, Wildrose Party on May 18, 2014 by Dave Cournoyer. Edmonton’s 2015 electoral districts as recommended by the Electoral Boundary Commission Final Report. Interesting nomination races are emerging across Alberta as parties prepare to choose candidates to run in the next federal election, slated for October 2015. Below are some of the most recent updates from ridings across the province, where candidates are seeking nominations to run in two by-elections and the general election. Conservative Party members will choose their candidate at nomination meetings in Pincher Creek on March 6, Claresholm on March 7 and Okotoks on March 8. Five candidates remain in the contest after Rick Waljamaa withdrew from the race. The remaining candidates include John Barlow, Melissa Mathieson, Phil Rowland, and Scott Wagner. Firearms lobby groups and conservative media pundits have intervened to ensure that guns have become the dominant issue of the campaign. First out of the gate, Kyle Harrietha announced that he is seeking the Liberal nomination to run in the impending by-election. Mr. Harrietha is a former Ottawa staffer and worked in Fort McMurray as the program manager of the Cumulative Environmental Management Association (CEMA). He now works as General Manager of Fort McMurray Métis Local 1935. The NDP have recruited their first nomination candidate in Lori McDaniel, a Suncor employee and health and safety representative for Unifor Local 707A. 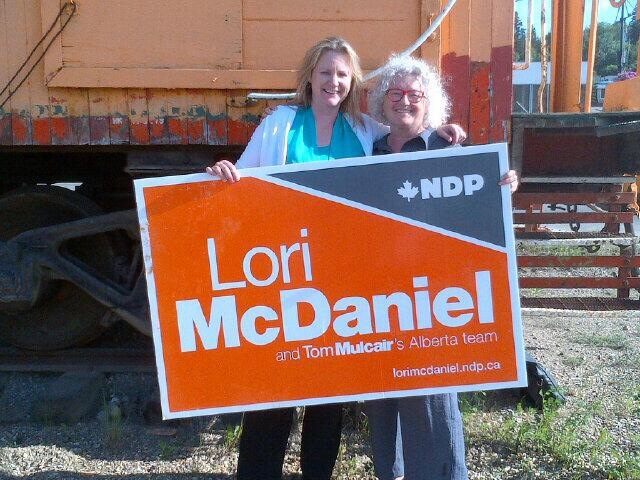 Ms. McDaniel announced her plans as NDP leader Thomas Mulcair visited Fort McMurray last week. Three-term councillor and former Athabasca County reeve David Yurdiga is the first candidate to enter the Conservative Party nomination contest. Mr. Yurdiga currently represents the Grasslands area, which will become part of the new Lakeland riding when the next general election is called and the new Fort McMurray-Cold Lake riding is created. The current boundaries will remain the same when the by-election is held. Incumbent Conservative MP Blake Richards will seek his party’s nomination in the new Banff-Airdrie riding. Mr. Richards has represented the current Wild Rose riding since 2006.
iPolitics.ca is reporting that Marlo Raynolds is seeking the Liberal Party nomination in the new Banff-Airdrie riding. Mr. Raynolds is the former executive director of the Pembina Institute and spoke at last weekend’s federal Liberal Party convention in Montreal on the topic of cities and infrastructure investment. He currently serves Vice-President of Market Development for BluEarth Renewables. Six Five candidates have stepped up to run for the NDP nomination in this east central Edmonton riding. Candidates include Canadian Labour Congress representative Amanda Freistadt, educator Janis Irwin, Cam McCormick, Namrata Gill, Bashir Mohamed and Zane Smith. Five-term Conservative Member of Parliament James Rajotte plans to seek his party’s nomination in the new Edmonton-Riverbend riding. He has represented southwest Edmonton since 2000. Three-term Conservative MP Mike Lake has announced his plans to seek the Conservative nomination in the new Edmonton-Wetaskiwin riding. Mr. Lake has represented Edmonton-Mill Woods-Beaumont since 2006 and lives in the south portion of Edmonton that will be included in the new riding. He will face Mohinder Banga for the Conservative nomination. For up-to-date nomination news, follow the list of Alberta Federal Election candidates. This entry was posted in Alberta Politics, Canadian Politics, Candidate nominations and tagged Amanda Freistadt, Athabasca County, Banff-Airdrie, Bashir Mohamed, Blake Richards, Cam McCormick, Canadian Labour Congress, David Yurdiga, Edmonton-Griesbach, Edmonton-Mill Woods-Beaumont, Edmonton-Riverbend, Edmonton-Wetaskiwin, Fort McMurray Métis Local 1935, Fort McMurray-Athabasca by-election, Fort McMurray-Cold Lake, James Rajotte, Janis Irwin, John Barlow, Kyle Harrietha, Lori McDaniel, Macleod By-Election, Marlo Raynolds, Melissa Mathieson, Mike Lake, Mohinder Banga, Namrata Gill, Pembina Institute, Phil Rowland, Rick Waljamaa, Scott Wagner, Thomas Mulcair, Unifor Local 707A, Wild Rose, Zane Smith on February 24, 2014 by Dave Cournoyer. 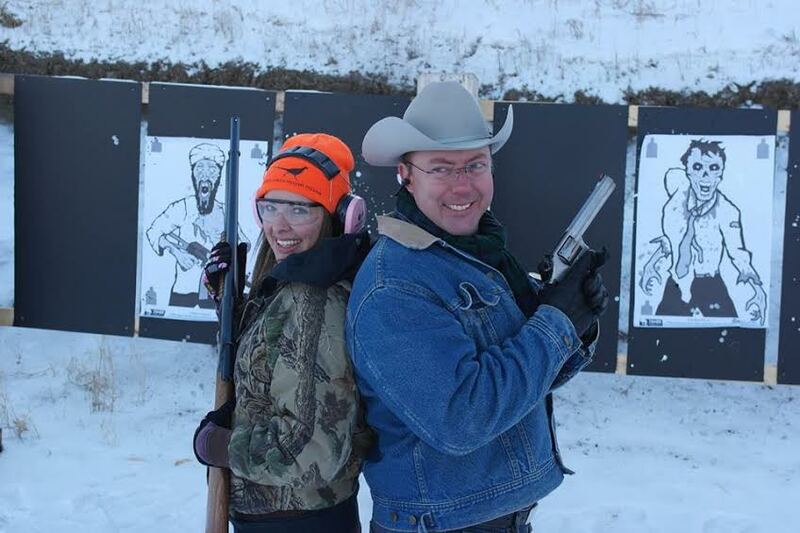 Conservative nomination candidate Melissa Mathieson and Calgary-West MP Rob Anders pose with their guns and targets: bearded men wearing turbans, and zombies. (Photo supplied by a friendly daveberta.ca reader). “Just say no-to-Barlow!” was the message broadcast to the 15,941 followers of the National Firearms Association Facebook page. 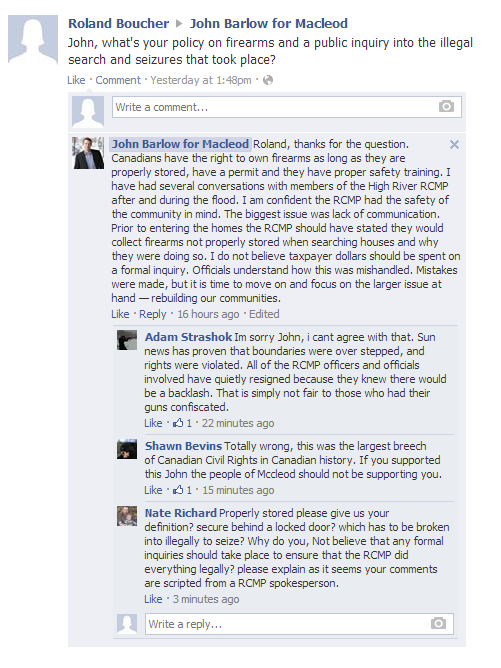 The controversy stems from a comment Mr. Barlow posted on his Facebook page defending the intentions of the local RCMP detachment during the flood. He later deleted the comment after the page was swarmed by critics (you can see the screenshot of Mr. Barlow’s comment here). A reasonable person might believe that collecting abandoned weapons in an disaster zone is a sensible idea for any police force wanting to avoid potentially dangerous confrontation with emotionally distressed citizens. But the gun lobby is not convinced and has encouraged its supporters to vote for other candidates in the Conservative nomination race. “We need concerned citizens in the Macleod riding to support either Philip Rowland or Melissa Mathieson,” the NFA said in another message posted on its Facebook page. It may not be a mere coincidence that these attacks have occurred just as Mr. Barlow’s opponent, Ms. Mathieson, received the endorsement of Shawn Bevins, the Vice President of the National Firearms Association and Todd Brown, the co-founder of the Concerned Gun Owners of Alberta group. A local newspaper editor and former provincial election candidate, Mr. Barlow’s chances of winning the hotly contested Conservative nomination received a boost last month when popular country music artist George Canyon endorsed his campaign. The two men have since been making campaign stops across the Macleod riding. Mr. Canyon is seeking the Conservative nomination in the neighbouring Bow River riding. The other candidates for the Conservative nomination in Macleod have released mixed reactions to the attacks. Scott Wagner issued a statement criticizing Mr. Barlow and calling for a judicial inquiry into the RCMP actions and Rick Wiljamma appears to have not responded to the attacks on his opponent through social media. This is not the first time this issue has been raised by politcians. Wildrose Party leader and local Highwood MLA Danielle Smith was raked over the coals last year for criticizing the RCMP in a fundraising letter to supporters. February 10 is the deadline for Macleod residents to purchase Conservative Party memberships in order to vote in the nomination contest. The date of the by-election has not been set. This entry was posted in Alberta Politics, Canadian Politics and tagged Bow River, Calgary-West, Canada National Firearms Association, Chris Flett, Colleen Tatum, Concerned Gun Owners of Alberta, Conservative Party of Canada, Danielle Smith, Fort McMurray-Athabasca by-election, George Canyon, Guy Boutilier, Highwood, Joanne Roberts, John Barlow, Kyle Harrietha, Laila Goodridge, Macleod By-Election, Melissa Mathieson, Phil Rowland, Rick Wiljamma, Rob Anders, Ron Quintal, Scott Wagner, Shawn Bevins, Todd Brown on February 5, 2014 by Dave Cournoyer. There has been plenty of activity this week as candidates from all political parties put forward their names to run in Canada’s next federal election, scheduled to be held in October 2015. Wooing voters and potential candidates alike, both New Democratic Party leader Thomas Mulcair and Liberal Party leader Justin Trudeau travelled through Alberta this week. Mr. Muclair visited Edmonton and attended party events with provincial NDP leader Brian Mason. Mr. Trudeau was a headliner at well-attended Liberal Party rallies in Okotoks, Calgary and Edmonton. 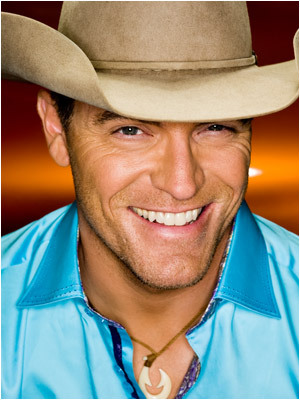 Award-winning country music artist George Canyon has announced his intentions to seek the Conservative Party nomination in the new Bow River riding. Mr. Canyon will coordinate his campaign with John Barlow, who is seeking the Conservative by-election nomination in neighbouring Macleod riding (an eastern portion of the new Foothills riding will become part of Bow River when the next federal general election is called). While he would be a star candidate for the Conservatives, he is expected to be joined by a large group of local conservatives interested in seeking the nomination. Calgary-Foothills PC MLA Len Webber announced his plans to seek the Conservative nomination in the new Calgary Confederation riding. Rumours of Mr. Webber’s jump into federal politics were first reported on this blog in November 2013. Consultant Susanne DiCocco is also seeking the Conservative nomination in this riding. Abdul Mohamud has announced his plans to seek the Liberal Party nomination in this new east Calgary riding. Tom Kmiec, a former staffer to Calgary MP Jason Kenney, is the first candidate to announce his candidacy for the the Conservative nomination in this new south east Calgary riding. Lawyer and Metis advocate Harold Robinson has joined the Liberal Party nomination in Edmonton-Centre. Mr. Robinson will face entrepreneur Randy Boissonnault in his party’s yet to be scheduled contest. The Edmonton-Centre Liberals announced on their Twitter account this week that 2011 candidate Mary MacDonald would not seek the nomination. PC MLA Janice Sarich is reportedly campaigning for the Conservative Party nomination in the new Edmonton-Griesbach riding. Ms. Sarich was an Edmonton Catholic school trustee from 2001 to 2007 and was elected as MLA for Edmonton-Decore in 2008. It is unclear whether current Edmonton-East MP Peter Goldring will seek his party’s nomination in the new riding. Mr. Goldring has represented the area in Ottawa since 1997. There are at least six candidates running for NDP nomination in Edmonton-Griesbach. The riding association is hosting a candidate meet and greet on January 31. The Globe & Mail reports that Edmonton-McClung PC MLA David Xiao is preparing to seek the Conservative nomination in the new Edmonton-West riding. This would not be Mr. Xiao’s first foray into federal politics. In 2004 he was defeated by Laurie Hawn in the Conservative nomination contest in Edmonton-Centre. Following the resignation of Conservative MP Brian Jean, rumours continue to swirl about who could seek the party nominations in an upcoming by-election. Former Wood Buffalo municipal councillor Don Scott, who was elected MLA for Fort McMurray-Conklin in 2012, is suspected by some to be eyeing the Conservative nomination, but might be hard pressed to leave his provincial cabinet post. Expected to seek the nomination is Laila Goodridge, a Fort McMurray-native and current constituency assistant to Calgary-Centre MP Joan Crockatt. Former Fort McMurray-Wood Buffalo MLA and current Wood Buffalo deputy mayor Guy Boutilier is being talked about as potentially seeking either the Conservative or Liberal Party nominations. First elected under the PC banner in 1997, Mr. Boutilier joined the Wildrose Party in 2011 and was defeated in the 2012 election. Investment advisor Doug McArthur will challenge incumbent MP Jim Hillyer for the Conservative Party nomination in the new Lethbridge riding. With a by-election expected in the coming months, five candidates – Melissa Mathieson, John Barlow, Scott Wagner, Phil Rowland and Rick Wiljamma – are vying for the Conservative Party nomination in Macleod. While no Wildrose MLAs from the area have officially endorsed a candidate in this race (as far as I have seen), Mr Barlow has received the endorsement of former Highwood PC MLA George Groeneveld and Ms. Mathieson has the endorsement of former Livingstone-Macleod PC MLA David Coutts. Peace River school administrator Terry Hogan is the first candidate to announce plans to seek the Conservative nomination in this new sprawling south west northwest Alberta riding. Cabinet minister Rona Ambrose announced her intentions today to seek the Conservative Party nomination in the new Sturgeon River riding. 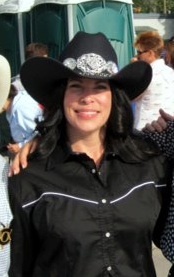 Ms. Ambrose has represented the rurban Edmonton-Spruce Grove riding since 2004. Visit the Federal Election 2015 page to find links to websites and social media accounts for candidates listed in this post and in previous updates. This entry was posted in Alberta Politics, Canadian Politics, Candidate nominations and tagged Abdul Mohamud, Bow River, Calgary Forest Lawn, Calgary-Centre, Calgary-Confederation, Calgary-Foothills, David Coutts, David Xiao, Don Scott, Doug McArthur, Edmonton-Centre, Edmonton-Decore, Edmonton-East, Edmonton-Griesbach, Edmonton-McClung, Edmonton-Spruce Grove, Fort McMurray-Athabasca, George Canyon, George Groeneveld, Guy Boutilier, Harold Robinson, Janice Sarich, Jason Kenney, Jim Hillyer, Joan Crockatt, John Barlow, Justin Trudeau, Laila Goodridge, Laurie Hawn, Len Webber, Lethbridge, Macleod By-Election, Mary MacDonald, Melissa Mathieson, Peter Goldring, Peter Lougheed, Phil Rowland, Randy Boissonnault, Rick Wiljamma, Rona Ambrose, Scott Tannas, Scott Wagner, Sturgeon River, Susanne DiCocco, Terry Hogan, Thomas Mulcair, Tom Kmiec on January 24, 2014 by Dave Cournoyer. Four candidates have stepped forward to contest the Conservative Party nomination in Macleod. 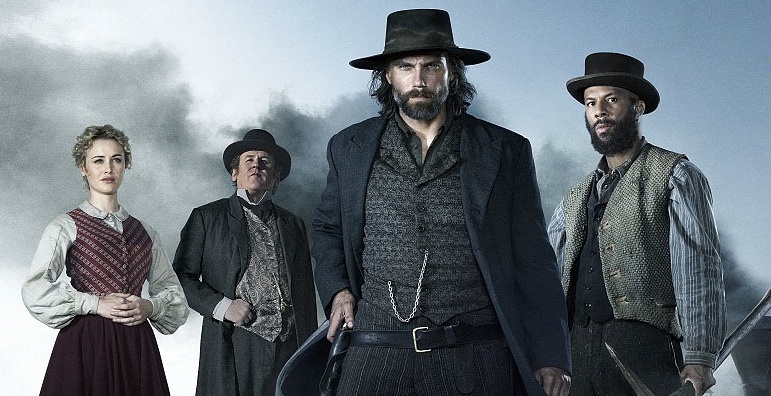 AMC’s ‘Hell on Wheels’ is filmed in the Macleod riding south of Calgary. Four candidates have stepped forward to duel for the yet to be scheduled Conservative Party nomination in southern Alberta’s Macleod riding following the resignation of Member of Parliament Ted Menzies. A by-election is expected to be held in the eastern slopes of Alberta’s cowboy country the next six months. John Barlow, the associate editor of the Okotoks Western Wheel newspaper announced his entry into nomination race this week. 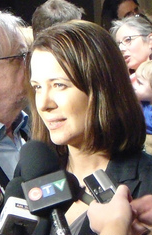 In the 2012 provincial election, as the Progressive Conservative candidate in the Highwood constituency, Mr. Barlow placed a surprisingly strong second behind Wildrose Party leader Danielle Smith. Fourth generation rancher and farmer Phil Rowland is also contesting the nomination. Mr. Rowland is the past president of the Western Stock Growers Association and serves on numerous provincial and agriculture boards. He also served as a board member for the Highwood PC Association during George Groeneveld‘s time as MLA. 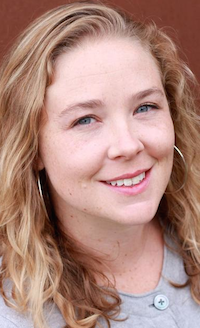 Former Parliament Hill staffer Melissa Mathieson has also entered the race. She currently works as a research associate for the School of Public Policy at the University of Calgary and, according to her LinkedIn profile, she graduated from the U of C in 2011 with a bachelor of political science and has since worked as an intern and staffer for Mr. Menzies and in the Office of the Prime Minister in Ottawa. Businessman Scott Wagner has been campaigning door-to-door since Mr. Menzies announced months ago that he would not seek re-election. Update: Rick Wiljamma is also seeking the Conservative nomination in Macleod. No candidates have stepped forward to become candidates for other political parties. Last year’s Calgary-Centre by-election exposed significant splits in the conservative movement in Alberta. With some moderate conservatives believing Conservative nominee Joan Crockatt was too closely associated with the Wildrose Party, many formerly reliable Conservative voters choose to park their votes with Liberal Party candidate Harvey Locke. A similar split is difficult to imagine in Macleod, but not impossible. Voters in this region of Alberta last elected a non-conservative Member of Parliament in 1968, when Trudeaumania swept Liberal Allen Sulatycky into office as the MP for sprawling Rocky Mountain riding (the election was contested by two PC candidates, who, not unexpectedly, split the vote). Mr. Sulatycky served as a parliamentary assistant for four years until he was defeated in the 1972 election by future Prime Minister Joe Clark. Voters in this riding have since reliably elected PC, Reform, Canadian Alliance, and Conservative MPs. Mr. Menzies earned 40,007 votes in the 2011 federal election, eclipsing his second-place New Democrat opponent, who earned 5,335 votes, and third place Green Party candidate, who earned 2,389 votes. The Liberal candidate placed a distant fourth with 1,898 votes. 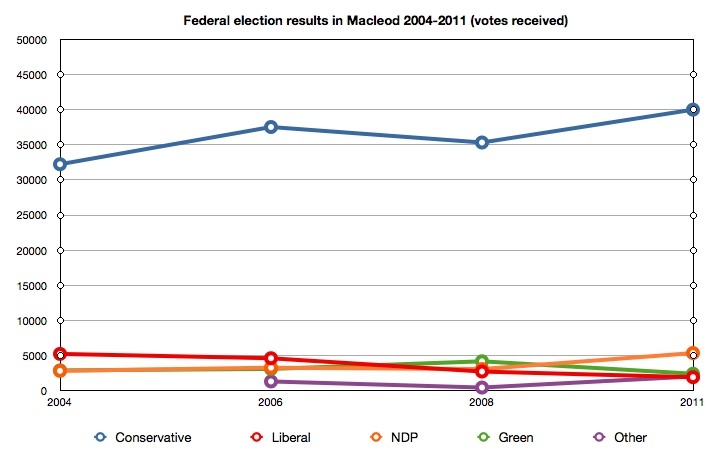 Voting results in the Macleod riding from the past four federal elections (2004-2011). But the riding’s history as a Conservative strong-hold over the past four decades does not mean Macleod voters do hold not grievances or should be taken for granted. Some areas of the riding, especially High River, suffered significant damage caused by this year’s floods and some residents have accused the RCMP of overstepping their bounds by removing privately-owned firearms from residences that had been evacuated during the flood. The federal riding also overlaps provincial constituencies represented by Wildrose MLAs Ms. Smith, Pat Stier, Ian Donovan, Jason Hale, Gary Bikman and PC MLA Ron Casey. All of these constituencies were hotly contested battle grounds in the 2012 provincial election when significant numbers of long-time PC voters shifted their support to the Wildrose Party. Under almost every normal circumstance this by-election should be an easy win for the nominated Conservative candidate. But as previous by-elections have demonstrated, the hyper-local focus on issues in an isolated by-election can sometimes produce unexpected results. An update to a recent post about federal party nominations in Alberta: educator Janis Irwin has announced her intention to seek the NDP nomination in the new Edmonton-Griesbach riding. This entry was posted in Alberta Politics and tagged Allen Sulatycky, Calgary-Centre, Conservative Party of Canada, Danielle Smith, Edmonton-Griesbach, Gary Bikman, George Groeneveld, Harvey Locke, Ian Donovan, Jason Hale, Joan Crockatt, Joe Clark, John Barlow, Macleod By-Election, Melissa Mathieson, Pat Stier, Phil Rowland, Rick Wiljamma, Ron Casey, Scott Wagner, Ted Menzies on November 14, 2013 by Dave Cournoyer. A big turnout at a recent election forum in Highwood. Okotoks, the little town with the international reputation for award-winning environmental sustainability, could very well be home to the next premier of Alberta, a climate-change denier. This is just one of many ironies of this 28th election in the province that birthed the oil/tarsands (depending on where you stand). It’s the first election in more than a decade where the Progressive Conservatives are actually in danger of a meltdown, not unlike the glaciers at the hands of our overheated climate. It’s not only global temperatures that are rising though, the good citizens of Highwood are split and tempers are flaring. In 2008, only 36% of voters bothered to come out and vote and the PC candidate, George Groeneveld, received 65% of the popular vote. It wasn’t exactly a contested race. But, if the two election forums held in Highwood are any indication, the turnout will likely be a lot higher this time. The first debate was held in Okotoks with PC candidate John Barlow, Alberta Liberal candidate Keegan Gibson and Wildrose candidate, Danielle Smith. Things got off to a cordial start, but soon the accusations were flying. The “conscience rights” uproar had just erupted onto the social media scene. Questions covered the full-range of issues from the incendiary (abortion) to the benign (whose signs were purchased locally). At the end of the evening, Smith’s closing remarks had a slightly more enthusiastic response from the crowd than Barlow’s. There was a lot of heckling and booing from both sides throughout. High River hosted the second forum last week. Again, the NDP candidate was missing from the debate. Liberal Gibson was a little more prepared this time, having met with local politicians and community members. High River has an older and more rural demographic. It’s also the community where Smith chose to take up residence. She’s still considered a newcomer rather than the hometown girl, though. The PC’s packed the conference hall with supporters. One woman told me the seats were filled 45 minutes before the forum began. The PC’s had a highly visible presence with their bright orange t-shirts and it seemed like the Wildrose supporters were mostly left standing along the side or sprinkled throughout the audience. Barlow was much more prepared this time and took Smith to task on a number of issues of local concern. Smith was thrown off a little by the hecklers and boos as she struggled to explain her party’s position on a number of issues. The social issues were not as much of a concern at this forum. It was all about education, water, property rights and healthcare. It was surprising to see how split the room was, as men in cowboy gear mumbled remarks under their breath, seniors argued with those sitting next to them, and neighbours shook their heads in exasperation. At the end, Barlow received more applause—but my guess is the crowd was mostly comprised of decided voters. The undecideds were in short supply, watchful and solemn. Given that spring flooding season is looming, this issue was top of mind. Barlow was at a disadvantage, given that his predecessor, Groeneveld’s flood mitigation report was never released to the public. Smith was quick to promise to release the report and even suggested a role for Groeneveld in implementing the recommendations, which went over well. Barlow was left with no response except his own personal opinion that the report should be released, which received awkward applause. Groeneveld was a well-liked MLA, snubbed by Stelmach and stripped of his cabinet position. The local PC association wrote a public letter of discontent at the time. In an earlier post, I wrote that it appeared Barlow got off to a slow start with his signs. According to later reports from Okotoks, he did manage to get some more signs out on lawns. This riding is by no means an easy win for Smith. 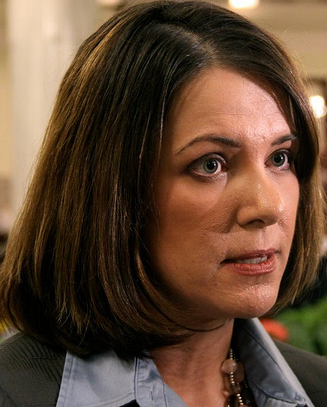 She is up against a well-organized, locally focused campaign by Barlow’s team. The Tory establishment backs Barlow and my guess is that fundraising would not have been a problem. The boundaries were adjusted in 2010, giving the two towns a little more sway over the results, which pose an interesting challenge for Smith. With the influx of environmentally conscious urbanites to Okotoks, Smith’s climate change position will hurt her with those voters. The Tory faithful won’t be budged and Barlow is a fresh, young family man—just the face they need to represent their stuffy, cadre of aging, wealthy landowners looking forward to retirement. 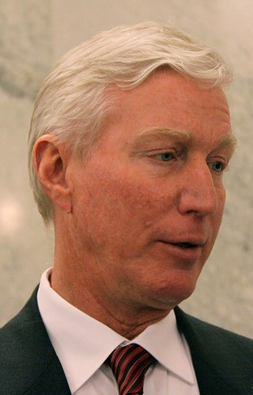 The property owners angry about the “bad bills” as Smith calls them, will decide the election. If these angry rural voters make it out in strong enough numbers, she will pull it off. Judging by the level of anger out there on the range, I think they will make the effort. Prior to the writ being dropped, Smith travelled the province and the riding for months campaigning extensively. This will likely hold her in good stead with voters in Highwood. I’m predicting a close race with underdog Barlow putting forward a good challenge, but with Smith edging him out in the end. Jody MacPherson raised a family in Okotoks, where she has extended family and many valued friends. She has since moved into Calgary and has been active in the Alberta Liberal Party for several years. Coincidentally, she now lives in Calgary-Elbow, Alison Redford’s home riding. This entry was posted in Alberta Politics and tagged Danielle Smith, Ed Stelmach, George Groeneveld, John Barlow, Keegan Gibson on April 22, 2012 by Dave Cournoyer. guest post: the election in highwood – week one. A trailer sign for Wildrose candidate Danielle Smith. The commute to Okotoks from Calgary is a scenic drive southwest with truly spectacular mountain views on a clear day. Having travelled the route almost daily for about 15 years, I saw something this week I’ve never seen before. Beginning at the turnoff to Dunbow Road on Highway 2, there is a series of election signs for a party other than the Progressive Conservatives (PC’s). The Wildrose Party’s Danielle Smith has a half dozen or more signs at regular intervals all the way into Okotoks. Not one PC sign could be found along the same stretch of road. The first sign of Smith’s PC rival, John Barlow, isn’t visible until just outside the town boundaries. Okotoks is adjacent to the famous Okotoks erratic, the largest of its kind in the world. It’s a town where political sensibilities shift as slowly as this “big rock,” left behind as the glaciers retreated 10,000 years ago. Don’t let the town’s sleepy, peaceful appearance fool you, though. There’s an epic battle being waged in the community on several fronts. The traditional power base in the town has been frustrated in its attempts to overturn the sustainable Okotoks model in favour of expanding residential development. They want to build a water pipeline to the community from Calgary to fuel growth in a town that has literally “tapped out” its water supply. A trailer sign for PC candidate John Barlow. In the surrounding Municipal District of Foothills, it’s a different story. The MD politicians have been a burr in the sides of the provincial government for several years now, resisting attempts at regionalization. Their motives are less about protecting the environment and more about preserving the rights of their constituents to control their land. Land use planning is the enemy in these parts. Okotoks is the largest town in the large, mostly rural riding of Highwood. Driving around, viewing the lawn signs, it looks as though Smith’s campaign has not yet penetrated these neighbourhoods. After the first week of the campaign, Barlow’s lawn signs seem to slightly outnumber Smith’s in most areas of town. In such a conservative stronghold, with an unprecedented battle unfolding, it’s surprising there are not more signs. 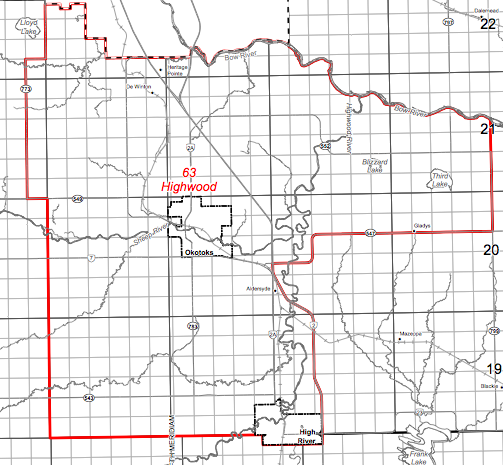 A map of the Highwood constituency. Barlow is a likeable candidate, strongly backed by business interests and younger families who can identify with his balance of community-mindedness and conservative sensibilities. He’s the comfortable choice. He’s also the associate publisher of the Western Wheel newspaper and showed questionable judgment by not stepping down from his duties immediately after being nominated as the PC candidate. He continued at the newspaper while also campaigning, not stepping down until after the writ was dropped. It’s worth noting that his backers are some of the same people who are calling for a water pipeline. When the National Post came to town to do a story on Highwood, they reported their conversation with former pharmacist Allen King, who they described as “tidying up” around Barlow’s office. They likely didn’t realize they had stumbled on one of the town’s biggest power brokers. King is an unapologetic, anti-sustainability, conservative columnist for the Wheel and true blue Tory royalty. Let’s be up front here. 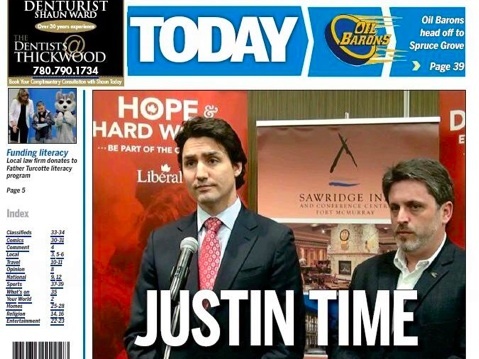 I’m a liberal, but I’ll admit Highwood shows no signs of electing a centre-left candidate any time soon. The PC’s captured 65 per cent of the popular vote in 2008. So, I’m not going to spend time on the other candidates. This is a showdown between Smith and Barlow. At first blush, Barlow might seem outgunned by the savvy, sophisticated Smith. A master politician, she’s demonstrated how to win votes, even when in unfamiliar territory and in a riding that doesn’t always welcome newcomers. This is Barlow’s first real foray into politics, but I’m not prepared to underestimate the Tory dynasty yet. They are likely putting significant effort into this race and Smith has to cover an entire province, by comparison. The riding was also one of redrawn to give it more of a “rurban” flavour. Rural residents are likely favouring the Wildrose, but their influence may have been neutralized somewhat by the boundary changes. I’d wager the Wildrose is strong in High River as well. Some of the more progressive voters might fear Smith’s right wing views and decide to vote for Barlow to try and keep her from winning. The worst possible outcome for Barlow is a low voter turnout. If disaffected PCs decide to stay home, rather than defend their party against the Wildrose onslaught, Smith will easily win. Given the dismal performance of the Tories thus far in the election, this seems like a serious concern for Barlow. He’s fighting an uphill battle with Smith’s political skill and Redford’s inability to control her wayward party. Okotoks will no doubt be the main battleground. A debate organized by the chamber of commerce and scheduled for April 10 will be standing room only. Smith and Barlow will go head to head. As I left town, I noticed yet another large billboard of Smith’s smiling face adorning a property south on Highway 2. Next to her sign, on the same property owner’s fence is a sign that reads, “Vote Ron Paul.” At this intersection, I turned left and drove back to Calgary. This entry was posted in Alberta Politics and tagged Alison Redford, Allen King, Danielle Smith, John Barlow on April 2, 2012 by Dave Cournoyer.